and the photos are supplied by Wendy and Noel. Western Quilters Raffle workshop was held on the 11 Aug 2012. There were 10 committee & 3 members of the Western Quilters who worked tirelessly on the piecing of the WQC Raffle Quilt for the 2013 Quilts Across the Ranges show in March 2013. There were members (Jo & Noel along with a bit of laughter) hand appliquéing stems onto the flowers, others (Pat, Julie, Ku, Wendy, Denise, Glenda & Jean machine appliquéing & making the ‘Courthouse Step’ blocks. Julie smiling nicely for the camera. Jean, Ku and Andrea having a serious discussion. Lunch time came:- Pizzas (brought to us by Lynne & Liz) along with fruit & cakes. Finally just after lunch it was decision time regarding putting the blocks together. 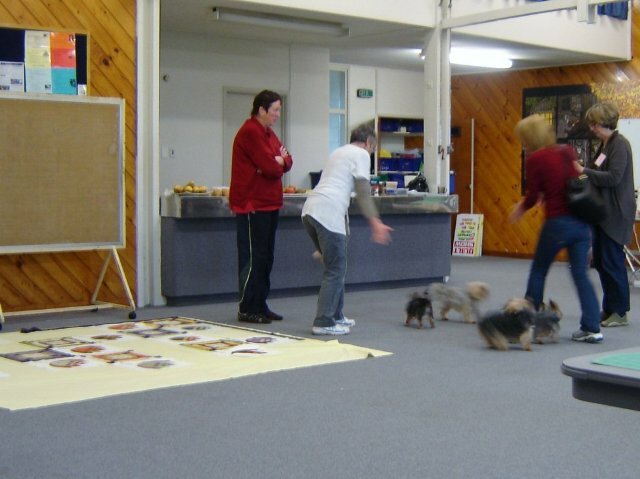 A bit like a jig saw puzzle, put all blocks down on the sheet, move them around, turn the flower stems in opposite directions, this was interspersed with the arrival of 6 ‘frisky’ Yorkshire Terriers – PANIC!!!!! The owner was a tad ??? no leads on any dogs & quite ‘frisky’ & definitely not well behaved. After having ushered them & owner (said silly female) out, we breathed a sigh of relief! Finally we pieced the top together, Ok time to get it all together:- rows 1 & 2 – please sew together, 3 & 4 likewise, 5 & 6, the same. 7 to 5/6 rows, 1 & 2 together 3 & 4 & then the final row was sown. Borders now on & ready for it to be quilted & finished off. Andrea was patiently hand sewing on numerous circles onto the 2nd prize - a table runner. Tablerunner for 2nd place prize. A good day was had by us all.